When thousands of US Marines flooded into Helmand eight years ago, they demonstrated a resolve to quash the Taliban once and for all and leave a peaceful province for Afghans to take over. Two years after, the Marines are back, in a sign that things turned out rather differently. “It feels like Groundhog Day,” said Staff Sergeant Robin Spotts, on his third Helmand deployment. The situation now is worse than when they left. Areas, where the US military had outposts and walked the bazaars, are now inaccessible even for Afghan forces. Of the province’s 14 districts, only two are firmly under government control. The Taliban are stronger in Helmand than anywhere else. The Afghan army’s 215th Corps in Helmand struggles not only with record-high casualties but deep-seated corruption that has gutted finances and morale. Self-employed status leaves workers vulnerable to "exploitation", the Work and Pensions Committee concluded. Staff should be designated as workers, with full rights, by default, MPs said. Last year an employment tribunal ruled that Uber drivers were wrongly classified as self-employed. In the report by the Work and Pensions Committee, chairman Frank Field said companies were "avoiding all their responsibilities" in order to profit from "bogus self-employed designation. This inquiry has convinced me of the need to offer 'worker' status to the drivers who work with those companies as the default option." Those changes would protect staff from "the appalling practices that have been reported to the committee in this inquiry". The Socialist Party neither promotes nor opposes, reforms to capitalism. We believe that socialists shouldn't work for reforms to capitalism because only a movement for socialism itself can establish socialism. In this coming election, there are those who will campaign for reforms believing either that reforms to capitalism will eventually result in some sort of socialism, or that supporting reforms is an appropriate way to convince workers to support socialism. Some put forward a reasonable analysis of capitalism, but then work to give capitalism a human face. Some claim that they want to end capitalism. The bottom line is, however, just capitalism with reforms. What are reforms? They are legislative and other enactments forced upon or necessary for governments in running the various forms of capitalism. We, in the Socialist Party, define reforms as political measures brought forward to amend the operation of capitalism in some way. We say because in a class divided system like capitalism, it is the state, controlled by the political apparatus, that is the institution operating this entire process. By extension, ‘reformism’ is the attempt to seek support so that political power and influence over the state can be obtained to enact reforms. So the key issue for socialists is not to advocate (or seek political support for) reform programmes, as this is reformism and leads to disastrous governments. We don’t do this and never have done. Do we oppose reforms? We are opposed to reformism – the policy of advocating reforms, either as a way of 'improving' capitalism or as a means to socialism – but we are not necessarily opposed to individual reforms which may be of benefit to the working class. However, we do not advocate any reform, because we hold that to do so would lead to a socialist party changing into a reformist party, attracting the support of non-socialists. Every organisation has to decide what it is working for, and whether that aim is important. Socialists made a choice. They chose to use their time and limited funds to work to eliminate the cause of the problems. One can pick any problem and often one can find that real improvements have taken place, usually after a very long period of agitation. Rarely, if ever, has the problem disappeared, and usually, other related problems have cropped up to fill the vacuum of destruction or suffering left by the "solution". The mistaken idea that we should devote our energies to improving capitalist society through reforms has led, certainly in absolute terms, to the most destructive century in history. What has been the most pernicious lie of the century? It is that hope for the future lay in the gradual, imperceptible, but certain amelioration of capitalism through the process of reform. The false hope of piecemeal improvement of an essentially cancerous system captured the imaginations of millions, exhausted their energies in the reformist struggle to humanise the profit system, and then left them dumbed by frustration. Whether the changes were to come through the division lobbies of Westminster or by gaining control of local councils or by humanitarian and "green" appeals for a nicer, gentler world, the system which puts profit before need has persistently spat the hope of humane capitalism back in the face of its advocates. The progressive enthusiasm of millions has been stamped out in this way. Dare we imagine how different it would have been if that energy—or even a half or a tenth of that energy—which has gone into reforming capitalism had gone into abolishing it? With a movement great in number, if still a minority, how much stronger would we be if our fellow workers had not experienced that bitter disillusionment of failed reformism and the indignity of abandoning principles for the sake of short-term gains? Should we who struck to undiluted socialist principles- the world for the workers with production solely for use, and nothing less—be the ones to bow our heads in defeat when the policy of reform, not revolution, has so miserably failed? Had we ever abandoned our socialist principles the very idea of a new society based on equality and co-operation would have been lost and that would have only compounded the tragedy. Whilst this is true, and in all circumstances, inescapable, one consequence of our principled stand is that for the most part, we do remain alienated from the political life of society. The Socialist Party does not accept the view that nothing but socialism concerns us and in regards to trade unionism, it has stated that the non-revolutionary phase of the struggle between the classes is as inevitable as the revolutionary. When the worker acquires revolutionary consciousness he is still compelled to make the non-revolutionary struggle. We fight in the here and now, where we are and where we can, rather than tell everyone to wait until the revolution comes and that all struggle is a diversion from creating a world socialist party. It doesn't mean we sit around and wait for a revolution. A blanket opposition to everything that does and can happen in capitalism in the guise of being true to socialist principles, would be ridiculous and taken to its ultimate, logical conclusion would lead to the situation whereby socialists in parliament determinedly resolved to oppose all reform measures as a matter of course, even those of clear benefit to workers or the socialist movement and by doing so inadvertently allying themselves with the forces of reaction to keep wars going, or oppose factory legislation and anything else that might benefit workers. We do not deny that certain reforms won by the working class have helped to improve our general living and working conditions. Indeed, we see little wrong with people campaigning for reforms that bring essential improvements and enhance the quality of their lives, and some reforms do indeed make a difference to the lives of millions and can be viewed as 'successful'. There are examples of this in such fields as education, housing, child employment, work conditions and social security. Socialists have to acknowledge that the "welfare" state, the NHS and so on, made living standards for some sections of the working class better than they had been under rampant capitalism and its early ideology of laissez-faire. However, in this regard, we also recognise that such 'successes' have in reality done little more than to keep workers and their families in efficient working order and, while it has taken the edge of the problem, it has rarely managed to remove the problem completely. After the Jewish Holocaust, people said: "Never Again". But genocide didn't stop. It continued. The conditions promoting genocide didn't go away, and so neither did the genocide. If the reformists had solved the myriad of problems or were even to be able to say that things were steadily improving, that would argue in favour of their approach to reform. But that is not the case. The same problems continue to appear and re-appear. It is often one step forward, several steps back. We argue that the working class should organise for socialism, but that doesn't mean that nothing can be done this side of the revolution. Such things as basic health care came into being because the working class fought for them (even though politicians have since claimed the credit). Without the threat of action, we would never have won such things. Strikes, or the threat of them, help to improve wages and working conditions. We have the ability to change things if we act together. The power to transform society lies in the hands of those who create everything - the working class. This is the source of our power, should we eventually use it. The power not to make a few reforms, but to change the whole system, to make a social revolution. The basis of the socialist argument is that the material conditions for socialism exist now but it can only come into being when the working class had matured politically to the point where it could commit itself to the new society. Leading the workers along the path of reform is not equipping them for their revolutionary role but was, in fact, establishing the contrary idea that capitalism could be made to function in the interests of the class it exploited. Some reforms e.g. securing freedom of speech, extending the franchise, stopping a war, benefit the entire working class and socialist movement. Democracy is not a set of rules or a parliament; it is a process, a process that must be fought for. The struggle for democracy is the struggle for socialism. It is not a struggle for reforms, for this or that political system, for this or that leader, for some rule change or other—it is the struggle for an idea, for a belief, a belief that we can run our own lives, that we have a right to a say in how society is run, for a belief that the responsibility for democracy lies not upon the politicians or their bureaucrats, but upon ourselves. Our view is to let the upholders of capitalism work for reforms while we put the revolutionary alternative. Socialist MPs and councillors would be mandated to put the case for socialism and to criticise reform activity from the socialist perspective. However, the long-established socialist position is that socialist delegates in such an environment would be duty-bound to consider voting for measures that could benefit the working class as a whole and/or the socialist movement in particular. These issues would be judged on their merits at the time, and could, for instance, involve socialist delegates voting to stop a war, such as the recent war in Iraq. In such a case abstention would not be justifiable. In taking this position, they would still make clear their opposition to capitalism as a whole and to all parties of capitalism and would at no time seek support from the working class on the basis of a reform programme. 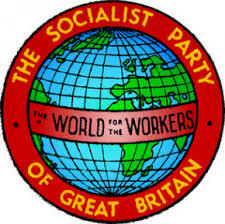 The Socialist Party does not oppose reformism because it is against improvements in workers' lives lest they dampen their revolutionary ardour; nor, because it thinks that decadent capitalism simply cannot deliver on any reforms; but because our continued existence as propertyless wage-slaves undermines whatever attempts we make to control and better our lives through reforms. "...Socialism declares that all the social phenomena of our days are the results of capitalism, manifestations of the class war, which will cease only with the disappearance of classes. Therefore the Socialist Party is a party of class and of revolution. On the other hand, the desire for some immediate bettering of his lot is too well engendered in the heart of man for him to lose hope, even against all logic. Logic is weak against the power of an instinctive desire. The political parties promise reforms to their electors just as a nurse promises the moon to a child. The Socialist Party is thus caught between the logic of its scientific principle and the universal desire for an immediate amelioration - ”something now”. It cannot betray its principle, but it is likewise impossible that this party- of men - can escape this human desire for reforms. This contradiction is, however, not without a solution. The conditions of existence of the wage-workers depends upon their wages. It is not determined by the legal law, but by the economic law of supply and demand...Social realities are outside of parliaments...the Houses of Parliament can do nothing - absolutely nothing - to modify the real wage of the workers. The legal law is of straw; the economic law is of iron. Why change the tax-gathering plate if you do not change what is put into it? To dream of bettering the conditions of existence by political means is Utopia. Although the bettering of the conditions of existence by way of political reform is impossible, it is not the same as regards the conditions of fighting, and it appears to us to be possible to make easier the struggle of the proletariat against the capitalist middle-class. ...By the very fact of capitalist production the proletariat is at war with the bourgeoisie. This struggle is sometimes hidden, at other times visible to the eyes of all, but it is without truce. Far from becoming less evident, conflicts increase daily. Some reforms would render the attacks of the proletariat more powerful, those of its adversary weaker, and would make the effort easier and more efficient..."
"we avail ourselves of all means for bettering the condition of our comrades the workers. We do not spurn reforms; but what we do refuse, and that in the most explicit manner, is the coming to an agreement with any faction whatsoever of the middle-class [read capitalist class], no matter by what name it may go. An agreement of this kind cannot be of any other consequence than to make Socialism responsible for the oppression which the capitalists exercise over the masses of the working-class..."
It is true that some reforms benefit some workers, but they may also benefit sections of the capitalist class. In the time-honoured squabble as to who should pay for the reforms and upkeep of the working class, it is but one between robbers over the cost of the robbery - the robbery of the working class in the field, factory, and workshop. That does not, however, prevent our masters, inveigling the workers into the fight. Once the workers are drawn into the controversy a double purpose is served. First, they stop fighting their employers and exploiters – the active enemies; secondly, their assistance is secured in shifting the "taxation burdens” on to other capitalists. Why should we support the manufacturing capitalists against the financial capitalists? The pro-capitalist argument for Family Allowances in the 1940s was that the employer paid the rate for the job (including an increment to cover a wife and children) even when most of the male population were unmarried. The Family Allowances plan was a scheme based on targeting provision on those workers actually with children. This reform allowed employers to make wage reductions for workers without families. The route of trying to change capitalism is the one that has been taken by most people who have wanted to improve society. Reformism has some attractions over revolution – especially if you lack imagination, don't like confrontations, prefer to think only in the short-term, and don't want to be accused of not living in the real world. You are also assured of being in good company because large numbers of people think (or fail to think) as you do. Reformism is a most excellent strategy if you want only small changes in society, and are satisfied with what you get (which is usually substantially less than what you were promised). The idea that capitalism can be humanised and changed by a series of reforms is almost as old as the capitalist system itself. But reforms are implemented by political parties that seek and get a mandate to run capitalism. The motives for reforms may include anxiety to relieve suffering and keenness to promote well-being, but the measures have the effect of serving the system rather than meeting the needs of individuals or groups. However, reformism is futile for two groups of people: those who expect that capitalism can be reformed to operate in the interests of the majority, and those who believe that a programme of reforms will “win the workers for the revolution” and hence make a contribution to the achievement of socialism. Therefore there are two kinds of reformism. One has no intention of bringing about revolutionary change (indeed it may use reforms to stem such change.) The other kind cherishes the mistaken belief that successful reforms will somehow prepare the ground for revolution. Reforms are seen as necessary first steps on the long road to eventual revolution. 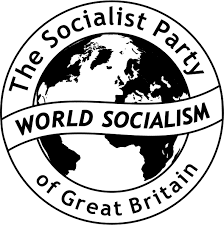 One of the most frequent criticisms of the Socialist Party is that while the policy of advocating socialism is useful and necessary for the ultimate solution of working-class problems, it is nevertheless a short-sighted and unrealistic policy to neglect to support measures of social reform designed to improve the conditions of the workers whilst capitalism is still in existence. It is urged that a socialist party should wage a guerrilla warfare with the capitalists in order to gain benefits, even if only temporary and minor, and that in doing so it would rally to the cause of socialism many workers who otherwise would not be prepared to support an organisation which appeared to have an excellent programme for the future but not for the present. This in its turn has increased the confusion in the minds of the workers, who feel that there can be very little wrong with capitalism when capitalist parties themselves are prepared to adopt what have been proclaimed to be “socialist” proposals which simply re-arrange and re-distribute the misery. The concept of class struggle and of revolution is alien to the rose-tinted reformists. As a socialist party, we tend to be hostile to the activities of reformers. This has a simple logic. In one way or another, reformists are supporters of capitalism. We are opposed to capitalism. Therefore we are opposed to the activities of those offering palliatives. However, what we find is that we share many of the basic hopes and intentions of many thousands of people who are active in all kinds organisations. Socialists do not hold a monopoly on social concern. For example, many people are concerned with the plight of millions of starving people and they try to do something about it. We share that concern, this is something that we have in common with them. So it is not true that we are hostile to all reformers. So how can we be more engaged with these people with whom we share some common ground? They are in organisations like Oxfam. They work voluntarily collecting money and running charity shops to finance workers in the field in many places, doing what they can to provide seeds, tools and equipment and small-scale irrigation schemes and things like fresh water wells. Others are in organisations such as the United Nations Association in the hope that agencies like the Food and Agricultural Organisation could do more to help the starving. We are quite right to say that these efforts do not stand a chance of ever being able to solve a problem that is getting worse. But rather than be hostile to the activities of these people we should adopt a much less alienated approach. 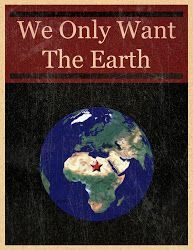 Instead of emphasising the futility of their activities; instead of shouting abstract slogans at them such as common ownership, democratic control and production for use; we could argue from a basis where we have set out how existing worldwide organisation already exists for dealing with the problem of world hunger. This more engaged approach would be to describe how the principles of common ownership, democratic control and production solely for use could be applied in practical ways. This would convert the higher abstractions of economic analysis into proposed lines of practical activity. This would in turn project what people in Oxfam are trying to do into a different social context in which their work could be more successful in solving the problem. This would draw their attention more directly to the need to alter the present economic and political framework which is so destructive of their efforts. This more engaged approach would be to acknowledge that they are doing what they can to lessen world hunger but the problem is getting worse, and then say, "The action to solve this problem must include action to bring about a society where you will have the freedom to act more effectively and this is how it could actually work. The work of solving the problem and the work of creating the conditions in which it can be solved go together." And of course the same approach could be directed at other organisations, for example, the many environmentalists. 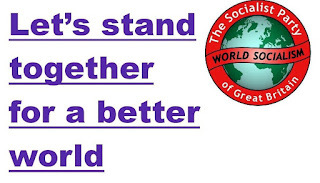 Socialists should build on our economic and political analysis and apply its logic to the development of all the socially useful factors of modern world society in setting out how socialism could operate. Then armed with this set of practical proposals we make every attempt to be more positively engaged with the many non-socialists with whom we share a common ground of concern and indignation and the need to establish a world of equality, democracy and co-operation. This new society can only come about when a majority want it and are determined to get it. Nobody can bring it about for you. So it's up to you, not the politicians. The future is in your hands, not theirs. 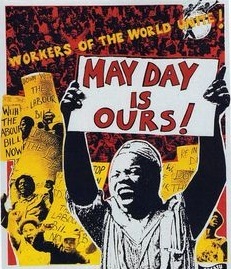 As marches and rallies take place around the country, we should highlight that May Day is first and foremost a day of solidarity with our fellow workers. 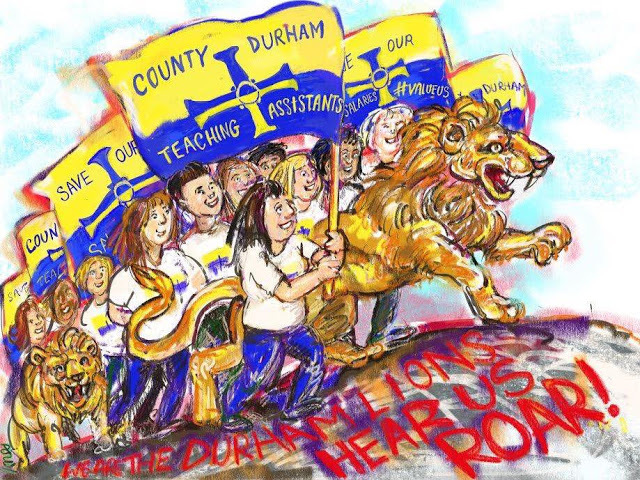 In Durham teaching assistants have been engaged in a long-standing dispute with their Labour Party controlled county council who are endeavouring to fire and rehire the teaching assistants with pay-cuts of 23%. They have shown in Durham what can be achieved by standing together and refusing to be a victim, refusing to accept something that is fundamentally wrong. To-day people around the world will be coming together for the People's Climate March to draw attention to of the world’s most pressing problems: climate change. The dream of a just and class-free society has long stirred the hopes of women and men, shackled by exploitation, poverty, oppression, and war. The early 19th-century labour movement envisioned a cooperative community of producers and many constructed intricate blueprints for egalitarian societies. So we can’t claim that Marx and Engels invented the idea of a society defined by common ownership, mutuality, freedom and equality. Capitalism has inflicted incalculable harm on the inhabitants of the earth. Tragically, the future could be even worse for a simple reason: capitalism’s destructive power, driven by its inner logic to expand, is doing irreversible damage to life in all its forms all around the planet. 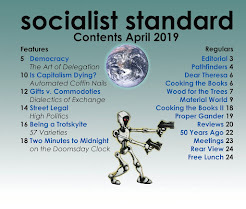 Rosa Luxemburg famously said that humanity had a choice, “socialism or barbarism.” In these days of climate change, her warning has even more meaning. Almost daily we hear of species extinction, global warming, resource depletion, deforestation, desertification, and on and on to the point where we are nearly accustomed to this gathering catastrophe. Our planet cannot indefinitely absorb the impact of profit-driven, growth-without-limits capitalism. To-day prominent figures warn of the possibility of human extinction as a result of man-made climate change. How could it come about that a species so intelligent, flexible and well-equipped could potentially destroy itself? Unless we radically change our methods of production and pattern of consumption, we will reach the point where the harmful effects to the environment will become irreversible. Even the most modest measures of environmental reform are resisted by sections of the capitalist class. This makes the establishment of a socialist society all the more imperative. One way or another, the coming decades will be decisive for the fate of human civilisation. Unless greenhouse emissions are swiftly and drastically curbed the result will be an environmental catastrophe on an almost unimaginable scale, threatening the survival of all life on the planet. The reality of climate change is already manifesting itself in an increasing number of extreme weather events, such as heat-waves, droughts, floods and typhoons. Melting ice sheets are resulting in rising sea levels and increased flooding of low-lying areas. Some islands will soon be totally submerged, turning their inhabitants into climate refugees. Some solutions to climate change are known and simple: rapidly phase out the use of fossil fuels, make the switch to renewables and halt deforestation. But significant economic interests at the heart of the capitalist system have big investments in coal, oil and gas. Protecting these interests, governments refuse to take more than token measures to halt climate change. The goal of the big corporations is to secure the greatest possible profits for their super-rich owners — regardless of the consequences to the planet and its people. Imagine an alternative, a society where each individual has the means to live a life of dignity and fulfillment, without exception; where discrimination and prejudice are wiped out; where all members of society are guaranteed a decent life, the means to contribute to society; and where the environment is protected and rehabilitated. This is socialism — a truly humane, a truly ecological society. With socialism, our work would engage our skills and bring personal satisfaction. Leisure time would be expanded and fulfilling. Our skies, oceans, lakes, rivers and streams will be pollution free. Our neighbourhoods would become green spaces for rest and recreation. Communal institutions, like cafeterias, will serve up healthy and delicious food and offer a menu of cultural events. The Socialist Party does not believe in achieving socialism through coercion or through violent seizure of power by a revolutionary vanguard. That's no basis upon which to build a fair and democratic society. No, the only way that socialism, as we understand it could be set up and run, is through the consent and cooperation of an overwhelming majority of the world's population. And the only way we will know once there is such a majority is when it says so via the ballot. It is then, and only then, that we will know that the time is ripe for socialist revolution. It is then that we can start dismantling the coercive machinery of government and start taking control of the things we need to make society function in our own interests. That the socialist revolution can only be international, creating a world-wide society where production is carried out solely to meet the needs and desires of its inhabitants. The Socialist Party argues that it is not enough to have demonstrators on the streets or workers occupying the factories. Above all, we say, our fellow-workers must have a clear understanding of what socialism entails and what methods are effective in overthrowing capitalism. A grasp of socialist principles by the vast majority of the workers is a minimal condition for going forward to socialism. No minority revolution can lead to socialism. Hence our conclusion that the movement to establish socialism, and the methods it employs, must “prefigure” the democratic nature of socialism. Socialism is the ongoing task of the majority; it cannot work top down; it cannot be imposed and cannot be legislated for by leaders, however well-intentioned. The socialist revolution necessarily involves the active and conscious participation of the great majority of workers, thus excluding the role of leadership. In considering the question of how realistic it is to expect a socialist revolution, it is important to consider the hidden history of events that most people are unaware of. It was in the Paris Commune of 1871 that French workers actually created organisations of mass control which challenged the old system for a brief space of time. In the Russian Revolutions of 1905 and 1917, workers and peasants developed similar structures of direct workers' control such as the workers' councils and factory committees. The Bolshevik seizure of power in October 1917 eventually destroyed this, and ushered in a system of state capitalism. Similarly, in the Hungarian Revolution of 1956, the workers set up workers' councils when they took on their so-called "communist" oppressors. During the May of 1968 in France, workplaces and universities were taken over and in many cases run in a way that is of immense inspiration to socialists. What happened on these occasions? Not socialist revolutions, as some claim. But they were significant in the history of the struggles of our class. They are significant because the sort of people who dismiss the possibility of revolutionary upheavals was dismissing it days and weeks before these events blew up in their faces. No one is in any position to dismiss the prospect of the revolution who has not carefully examined these movements. In none of these cases was a socialist revolution achieved, but in each case, there was a fundamental interruption of the ruling order and the appearance of new forms and conceptions of everyday life. To ignore them because of their failure is to miss the point. Individual revolts are bound to fail until they are accompanied by a widespread and growing—and ultimately worldwide—socialist consciousness. The socialist revolution must be world-wide and cannot be achieved in one country alone. Because capitalism has become a world-wide system the society to replace it must also be world-wide. Class emancipation must mean the freeing of the whole of society from exploitation, oppression and class struggle. What we hope by citing these historic examples can show that real change can be brought about by people themselves. Socialism is not a utopian dream. It is an ever-present undercurrent in working class struggles. The task is to make it the main one. That these revolts did not go farther is hardly surprising. What is inspiring is that they went as far as they did. The socialist revolution is not likely to start from some strike over wages spreading to the whole of the working class. Certainly, workers can learn from the experience of industrial struggles against employers that socialism is the only way out and, in this sense, strikes can contribute to a growth of socialist consciousness. But so can the many other experiences of the way capitalism works against the interests of workers (bad housing, poor health care, pollution, wars and the threat of war, etc, etc). 99 percent of the socialist revolution consists of imbuing our class with the confidence and ambition to succeed, and a revulsion of living as wage slaves whether pampered or ill-fed: once we have this our numbers will carry the day. The productive powers have been increased to a vast degree, yet people are still idle, starving, poverty stricken, and homeless, while the machinery of production is misused or neglected. This must change. This will change. This, the 21st century can be the true century of revolution, of true socialist revolution. A socialist revolution, a democratic revolution without leaders, is an urgent necessity. May Day Festival organised as an annual event by Burnley TUC. The Socialist Party will have a stall at this event and have literature for sale and give away along with the opportunity to speak to workers and exchange views and ideas. Another Peoples Climate March is planned for April 29, 2017 in Washington, DC focused on fighting for climate, jobs and justice. The coalition picked the 29th because it would be the 100th day of the new administration. 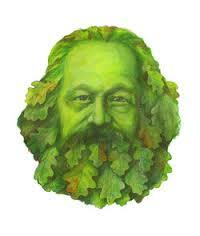 Certain environmentalists adopt a rather smug attitude concerning proper green lifestyles. They leave out the material pressures upon millions of workers which leave them no option to live healthily. Many in the Green movement supported by some scientists imagine that a sustainable environment-friendly world can be achieved through reforms of the market system. This is impossible. The capitalist system has destructive features which cannot be removed through reform. How is it possible for us to choose non-destructive production methods when these are in the hands of corporations which must place profit before needs? 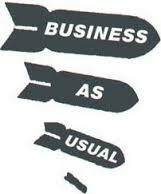 How is it possible for us to co-operate when we are dominated by economic competition? How is it possible to build a stable way of life, a non-growth system in balance with nature, while retaining a market system which is driven by a relentless pressure to renew its capacity for sales at a profit? The activists in the environmentalist movement must face up to these questions. Capitalism is primarily a system of capital accumulation and with any faltering of this anti-social aim it breaks down in crisis and a worsening of all social conditions. For sure, some efforts, both technological and legislative, will no doubt be made to deal with the effects of global warming. However, it can be said with certainty that any environmental improvements will come second to the accumulation of profits by the capitalist class. Capitalism is based on the exploitation of the working class in the production process and exists only to make profit and accumulate capital. Workers have no control over pollution, locally or globally, while the state exists only to further the interests of the capitalist class, taking action only when their general or particular interests warrant it. Capitalists only adopt new technologies and working methods when it is profitable to do so, not because the existing ones happen to be polluting the planet. It is sheer folly to believe capitalists will adopt an environmental policy if their competitors elsewhere in the world market do not. What would shareholders say to a board of directors which introduced costly anti-pollution machinery or practices if it meant that the company lost its competitive edge and market as a result? 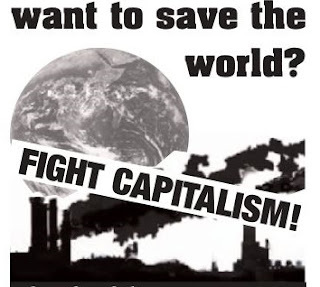 The false belief that problems can be solved by reforming the market system has led to the death of every decent hope for humanity To avoid such a disastrous outcome we urge all those who wish to protect the environment—to join the work of establishing socialism. It is the only sure and practical way forward. With the planet held in common by all people and on this basis democratic decisions about how best to organise life in non-destructive ways could be freely made. There would be no economic constraints preventing us from using ecologically-sound methods. We would carry out the work through direct co-operation. A society which was not constrained by private property, commodity production and buying and selling would use as a matter of course the best possible technology at hand to ensure the safety of those working in the plants and the protection of the natural environment. Social cost would be the deciding factor, not commercial cost. Capitalism is unable to do this. While the planet will survive in some shape or form, there is now a fair chance the human race will not. Brazilian trade unions backed by various social movements are striking against the relaxation of restrictions on outsourcing and temporary contracts. new anti-union laws and austerity cuts on pensions. It is the first nationwide general strike in 21 years. 35 million Brazilians didn't show up for work on Friday, more than one-third of the working population and many thousands took to the streets in anger Sao Paulo, Brazil's most populous city and financial center, was the worst affected. All public transport networks were closed, bringing the city to a standstill. General Motors, Ford, Toyota and Mercedes-Benz parent Daimler AG all halted production. "We are demanding our rights, as workers, because the president of the country proposed a law for people to work more and live less, so you will only receive your pension when you die," said Edgar Fernandes, a dock worker who was protesting in Rio. Brazil’s largest labour unions, like the Central Única dos Trabalhadores (CUT) and Força Sindical, are organizing the strike. Other groups who have joined in organizing the strike are Frente Brasil Popular and Povo Sem Medo. “I am standing to raise the issue of the need for the shared and democratic ownership of the Earth’s resources, with all goods and services produced for use, rather than for profit. “The current crisis in social care in Surrey is a pressing example of why this change is necessary. Its root cause is today’s outdated system where finance determines what can, and cannot happen. "I am standing to make the point that local problems arise from the economic system of production for profit that exists everywhere and that they cannot be solved unless this system is replaced by one based on common ownership and democratic control of the means of production, and access for all to what they need on the basis of 'from each according to their ability, to each according to their needs." The Socialist Party opposes those political parties that promise to deliver a programme of reforms on behalf of the working class, often in order to gain a position of power. Such groups on the left-wing, often have real aims quite different to the reform programme they peddle. Many of these leftists are going to put before the working class only what they think will be understood by the workers - proposals to improve and reform the present capitalist system - and, of course, they are going to try to assume the leadership of such struggles as a way of achieving support for their vanguard party. These Left parties may try to initiate such struggles themselves and they will try to muscle in on any struggles of this sort that groups of workers have started off themselves. The ultimate result of this is disillusionment. The Socialist Party understands only too well the urge to do something now, to take action and create some sort of change. That makes us all the more determined, however, to get the message across, to clear away the barrier of the wages system, so that we can begin to build a truly human society. Why waste time fighting for half measures? We would better spend our time, energies, and resources educating people to establish socialism rather than waste time in the false belief that our present system can be made to work in everyone's interest. We do not claim “capitalist reforms” stand in the way of achieving socialism. If we did we'd logically have to oppose them; which we don't. We encourage workers to fight back against employers and, although we don't propose or advocate reforms, we don't oppose them if they genuinely do improve workers' lives under capitalism. What we say is not that they are obstacles to socialism but merely that they are irrelevant to socialism and that a socialist party should not advocate reforms. If you are convinced, however, that groups or parties promising reforms deserve your support, we would urge you to consider the following points. The campaign, whether directed at right-wing or left-wing governments, will often only succeed if it can be reconciled with the profit-making needs of the system. In other words, the reform will often be turned to the benefit of the capitalist class at the expense of any working class gain. Any reform can be reversed and eroded later if a government finds it necessary. Reforms rarely, if ever, actually solve the problem they were intended to solve. Socialists within the Socialist Party make a choice. We choose to use our time and limited funds to work to eliminate the cause of the problems. One can pick any single problem and find that improvements have taken place, usually only after a very long period of agitation. But rarely, if ever, has the problem actually disappeared, and usually, other related problems have arisen to fill the vacuum of left by the "solution". If the view remains that the struggle for reforms is worthwhile then imagine just how many palliatives and ameliorations will be offered and conceded by a besieged capitalist class in a desperate attempt to retain ownership rights if the working class were demanding the maximum programme of full and complete appropriation and nothing less . To stem the socialist tide the capitalist parties will sink their differences and draw closer together, much as religions do today in the face of the world avalanche of atheism. 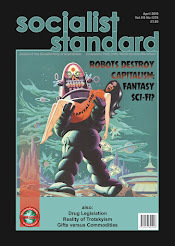 Reforms now derided as Utopian will be two a penny - in an attempt to fob off the workers. Perhaps, for example, capitalism will provide a batch of free services, on the understanding that this is "the beginning" of a free society, but socialists will not be taken in. If a pipe bursts and the water is flooding the house, one can start bailing the water out while it continues to flow in, or one can turn the water off, and then start bailing it out. It may take a while to find the tap, but unless the water is turned off, the water will continue to rise and bailing is rather pointless. Socialists are not immune to the human tragedies which occur daily, by the millions, and which generate tens of thousands of activists to trying to stem the flood. Socialists suffer those tragedies as severely as anyone else but work to encourage people to find the tap and turn it off. Street stalls on the 1st Saturday of the month in Cardiff and the 3rd Saturday of the month in Swansea. Cardiff stall will be located at the Newport Road end of Queen Street (10 am to 12 noon). Swansea stall will be located around the entrance to the market on Oxford Street (11 am to 1 pm). Dr Peter Boylan, one of Ireland’s most respected obstetricians has resigned from the board of a maternity hospital over plans to transfer its ownership to a religious order that ran institutions where women were enslaved and children abused for decades. Secular campaigners have been leading the opposition to the government’s plan – which emerged earlier this month – to move the National maternity hospital in Dublin to the St Vincent’s Elm Park campus, which is owned by the Sisters of Charity. The Catholic order – still owes €3m (£2.5m) to a government compensation scheme for victims of institutional abuse. The Sisters of Charity never issued a general public apology for the abuse suffered by children in their care. The minister for health, Simon Harris, has insisted that Catholic ownership of the hospital will not influence the care it provides. We can consider another hospital run by the Sisters of Charity to see how much credence to give that. At St Vincent’s, nuns sit on the board of directors and doctors must sign contracts promising adherence to the ethos of the hospital. The ethos stated on the hospital’s website is “to bring the healing love of Christ to all we serve.” The first stated core value is “respecting the sacredness of human life and the dignity and uniqueness of each person”, which, anyone fighting for reproductive rights in Ireland can tell you, is code for “every zygote has a soul”. If and when Irish women finally win abortion rights, will the National Maternity Hospital implement them? Just to recap: the state spends €82m on a report that uncovers heinous abuses perpetrated by Catholic orders against the children it paid them to care for; it pays out over €1bn to the victims, while the godly shirk financial and moral responsibility. It commits another €58m compensating women, while the cassocked again decree themselves blameless. And it learns what? That Ireland needs further integration of church and state. On Friday 28th April, millions of workers across the world will remember those killed at and by work as part of International Workers' Memorial Day. Many commemorative days receive mass attention, environmental, health and safety issues in the workplace are barely acknowledged. A few employers may care about the safety of their workers, but in general, capitalists seek to maximize profit. That means they will pay more for safety only insofar as they are forced to bear medical and other costs associated with injuries – through workers’ compensation, for instance. It is clear that much work is potentially dangerous, such as anything involving chemicals, machinery or working above ground. But that does not by itself explain why there are so many injuries, fatal and otherwise. While ‘accidents’ cost money, regulations and enforcement are expensive too. All impinge on profits, which are the main reason for production under capitalism. Companies will say that they take health and safety seriously, but they have to take profit most seriously of all. We cannot say that there would be no workplace deaths or injuries in a socialist society, but we can be sure that the safety and well-being of those who produce the goods and services will be paramount. There will be no shortcuts, no cheap and nasty solutions, no forcing people to work in unsafe situations. Producing in the interest of the whole community will include making production as safe as is humanly possible – something that capitalism simply cannot deliver. Yemen - Where is the urgency? The war Britain supports and supplies. 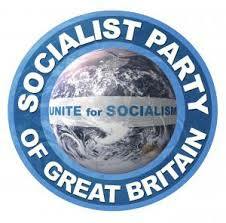 Why Support the Socialist Party? Who you want to believe?